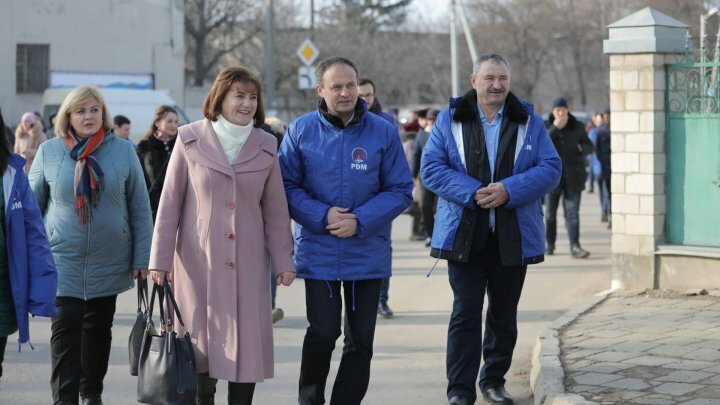 New bridge over Prut, connection to aqueduct and sewage, street lighting and renovation of schools, these are projects that PDM candidate Eufrosinia Greţu on constituency no. 41 in Leova will carry out. The plans were discussed with citizens within the PDM caravan led by PDM vice-president, Andrian Candu. PDM team walked through the city to see the achievements made. The first thing that captured their attention was the good roads built under the Good Roads for Moldova project. Not all the roads were repaired, so Andrian Candu helped a mother pull her baby with the stroller. - We want the good projects to be continued, more roads are enhanced. - This is the painful problem of our country. Then, the PDM caravan arrived at the Leova District Hospital. Doctors and other employees appreciated the system reforms implemented by the government and asked for further projects. "I only have a request that the reforms will be implemented faster. We trust that PDM will take office. I have two surgeons in Chisinau who want to come to Leova but I do not know what will be with the hospital. If it works, they will come", said a doctor. "First of all, we will not shut down the district hospitals as it has been. The reforms need to be done as efficiently as possible. It needs to be approved and people will come to Leova", said Andrian Candu, vice president of the PDM. A block of 92 social apartments was put into operation to keep young specialists in the district. There are inhabitants already at the block. Ruslan and Aliona Ţîcău benefited from the social apartment. The woman works in the District Hospital, and the man is a priest. They have three children. Before moving to the new apartment, they were forced to live with their parents in the village. "I left Moldova, but it's far better to stay home, near my family and my children", said Ruslan Ţicău, priest. "Staying home is always better, the family is here", said Andrian Candu. Another project that could become true in Leova is the construction of a 200-meter bridge above the Prut. Eufrosinia Greţu, the PDM candidate on the 41st constituency, says the bridge will be an opportunity to develop the city. Being the district president for years, Eufrosinia Greţu carried out many projects in Leova that she wants to persist in the near future. "I know the situation in this locality best. In Cantemir, I knew the problems in all 17 localities I presented. After elections we will talk again with the citizens, the local authorities and establish together all priorities. I see that all citizens want these projects, we will prolong them because they are absolutely necessary", said Eufrosinia Greţu, a PDM candidate in the constituency no. 41 Leova. There are 6 candidates in the uninominal constituency no. 41 in Leova.